Start off your visit on the 5th (Tue): see the sky in a new way at Denver Museum of Nature & Science, then admire nature's wide array of creatures at Denver Zoo, then take in the architecture and atmosphere at Trinity United Methodist Church, and finally steep yourself in history at Union Station. Here are some ideas for day two: explore the galleries of Denver Botanic Gardens, then explore the world behind art at Denver Art Museum, then take a stroll through 16th Street Mall, and finally get curious at Butterfly Pavilion and Insect Center. To see where to stay, maps, ratings, and more tourist information, refer to the Denver travel route tool . Boulder to Denver is an approximately 1-hour car ride. You can also take a bus. In March, daily temperatures in Denver can reach 55°F, while at night they dip to 29°F. Wrap up your sightseeing on the 7th (Thu) early enough to travel to Las Vegas. 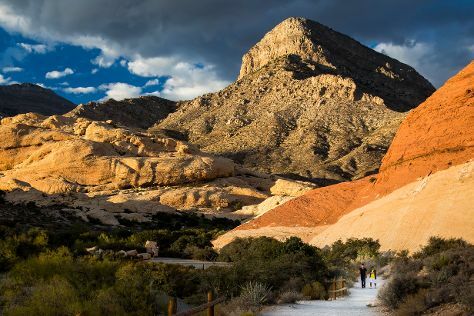 On the 7th (Thu), explore the stunning scenery at Red Rock Canyon National Conservation Area. Here are some ideas for day two: see the interesting displays at The Mob Museum, shop like a local with The Strip, and then ponder the design of Bellagio Fountains. To see where to stay, traveler tips, photos, and tourist information, read Las Vegas holiday planning app . You can fly from Denver to Las Vegas in 4.5 hours. Other options are to do a combination of bus and flight; or drive. The time zone changes from Mountain Standard Time (MST) to Pacific Standard Time (PST), which is usually a -1 hour difference. While traveling from Denver, expect somewhat warmer days and much hotter nights in Las Vegas, ranging from highs of 74°F to lows of 52°F. Finish your sightseeing early on the 9th (Sat) to allow enough time to travel to Grand Canyon National Park. Kick off your visit on the 9th (Sat): stroll through South Kaibab Trail, explore the stunning scenery at Grand Canyon South Rim, then contemplate the long history of Hermit's Rest, and finally explore the stunning scenery at Yavapai Point. On the next day, see the interesting displays at Kolb Studio and then tour the pleasant surroundings at Rim Trail. Take the guesswork out of planning a Grand Canyon National Park vacation by using our trip itinerary maker. Traveling by combination of car and flight from Las Vegas to Grand Canyon National Park takes 4.5 hours. Alternatively, you can drive; or take a shuttle. You'll lose 1 hour traveling from Las Vegas to Grand Canyon National Park due to the time zone difference. When traveling from Las Vegas in March, plan for slightly colder days and much colder nights in Grand Canyon National Park: temperatures range from 57°F by day to 23°F at night. Finish up your sightseeing early on the 10th (Sun) so you can go by car back home.